Andrew Lloyd Webber's musical Phantom of the Opera became the longest-running show in Broadway history at the Majestic Theatre on Monday night. The 7,468th performance of the award-winning show in New York overtook the record set by Cats, another of Lord Lloyd-Webber's shows. The 57-year-old said he was finding the "overwhelming" fact hard to take in. The musical, which premiered in London in 1986, has been seen by more than 80m people worldwide. The show was premiered two years earlier at London's Her Majesty's Theatre. "There is no formula for success in musical theatre. It's just one of those things - it happened," he told BBC News 24. "So I don't really know...I think it's a primal tale, it's highly romantic. I think most people feel there's something about themselves that they'd like to alter in their physical appearance and perhaps they relate to the phantom for that reason. The show's producer Sir Cameron Mackintosh said: "The musical is a kind of beauty-and-the-beast story. It appeals to everyone because it is about an impossible love, which I think many of us have had." The musical is also the most successful entertainment venture of all time, with worldwide box office takings of more than $3.2bn (£1.8bn). This greatly exceeded the $1.2bn (£670m) taken by Titanic, the world's highest-grossing movie. 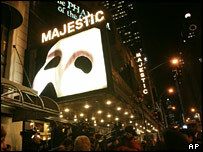 Over 65,000 performances of Phantom of the Opera have been staged in 119 cities in 24 countries. 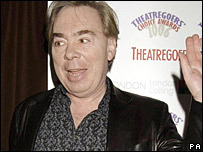 "The extraordinary thing which is a bit overwhelming is that it's my own show that I'm taking the record off, which I never thought would happen to me in my career at all," Lord Lloyd-Webber said. "The only thing that has hit me is it's an achievement I'll never be able to top." A gala performance on Monday took place, followed by a masked ball at the Waldorf Astoria Hotel attended by original star Michael Crawford. Lord Lloyd-Webber's ex-wife Sarah Brightman, the first singer to play female lead Christine, was unable to attend the event due to recording commitments. Phantom of the Opera opened in January 1988 with a then-record advance of $18m (£10m) - but Lord Lloyd-Webber said he could not have guessed the scale of its US success. "One could sense it from the moment it got in front of an audience in any form that there was something about it that was a bit special," he said. "It wasn't the same as any of the other shows I've been involved with because I've never had another show where I've had my wife in it." Lord Lloyd-Webber added that he wanted British TV presenter and singer Cilla Black to perform at New York's prestigious cabaret venue Cafe Carlyle. "I'm just trying to get her to say yes," he said. "I think everybody would absolutely fall in love with her and she'd be the toast of New York instantly."